For thousands of years, the Takelma Indians inhabited the Illinois Valley. Their culture was destroyed when gold was discovered in the early 1850s, causing the subsequent Rogue River Wars. After an 1853 treaty, most of the Takelmas lived on the Table Rock Reservation. In 1856, after the wars ended, they were moved to the Grand Ronde Reservation and the Siletz Reservation. The first gold in Oregon history was found in the Illinois Valley, as well as the largest gold nugget (17 lb or 7.7 kg). In 1904, more than 50 years after prospectors had started combing the valley for gold, an 18-year-old named Ray Briggs discovered what newspapers at the time called "the most wonderful gold discovery ever reported in Oregon history." While hunting along Sucker Creek, he discovered gold lying on the ground. He staked a claim and called it the "Wounded Buck Mine," which produced 1,777 ounces (50.4 kg) of gold. The "mine" was a small vein of gold 12 to 14 inches (30 to 36 cm) wide, 12 feet (3.7 m) long and 7 feet (2.1 m) deep. As gold mining in the Illinois Valley became exhausted in the 1860s and 1870s, the residents diversified into ranching, fishing, logging, tourism and agriculture. In 1874, Elijah Davidson found a cave while on a hunting trip, and is now credited with discovering the Oregon Caves. In 1884, Walter C. Burch heard about the cave from Davidson, and staked a squatter's claim at the mouth of the caves. He and his brothers-in-law charged one dollar for a guided tour. According to their advertisement in the Grants Pass Courier, this included camping, plentiful pasture land and "medicinal" cave waters. They attempted to acquire title to the land, but as the land was unsurveyed, they abandoned the idea a few years later. President William Howard Taft established the 480-acre Oregon Caves National Monument on July 12, 1909, to be administered by the U.S. Forest Service. In 1923, the Forest Service subcontracted the building of a hotel and guide services to a group of Grants Pass businessmen. By 1926, the monument had a chalet and seven two-bedroom cabins. Traffic into the caves led to a community developing at the junction of the Redwood Highway and the branch highway to the caves (now known as Oregon Route 46). 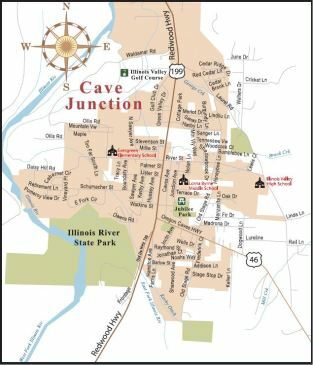 Cave Junction, originally known as Cave City, was established in 1926 on land donated by Elwood Hussey. In 1935, a post office was applied for and was named "Caves City", however postal authorities disapproved of the name, partly because "City" implied the place was incorporated. 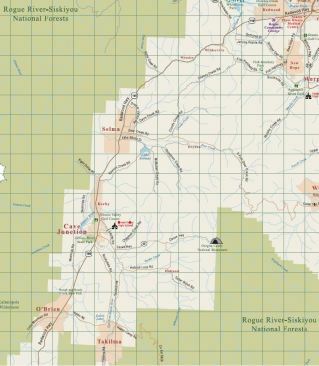 Among the other names suggested was "Cave Junction", which was adopted by the United States Board on Geographic Names in 1936 with the post office being renamed the same year. The locality was incorporated as Cave Junction in 1948, and is the only incorporated area in the Illinois Valley. In 1950 Cave Junction had a population of 283, which decreased to 248 in 1960 and increased to 415 in 1970. Its growth was fast in the 1960s, increasing at an average of 6.8 percent annually. The city population's primary growth period occurred in the 1970s, with an average annual increase of 9.9 percent. Growth slowed in the 1980s when the population increase averaged only 1.7 percent annually. The rate fell further between 1990 and 1998, averaging 1.6 percent, which was less than the state and county averages. As of the census of 2010, there were 1,883 people, 815 households, and 469 families residing in the city. The population density was 1,040.3 inhabitants per square mile (401.7/km2). There were 916 housing units at an average density of 506.1 per square mile (195.4/km2). The racial makeup of the city was 90.3% White, 0.4% African American, 2.0% Native American, 1.3% Asian, 0.1% Pacific Islander, 1.9% from other races, and 3.9% from two or more races. Hispanic or Latino of any race were 8.3% of the population. There were 815 households of which 26.9% had children under the age of 18 living with them, 38.9% were married couples living together, 13.3% had a female householder with no husband present, 5.4% had a male householder with no wife present, and 42.5% were non-families. 34.8% of all households were made up of individuals and 15.8% had someone living alone who was 65 years of age or older. The average household size was 2.30 and the average family size was 2.94. The median age in the city was 43 years. 23.7% of residents were under the age of 18; 8.8% were between the ages of 18 and 24; 19.1% were from 25 to 44; 27.4% were from 45 to 64; and 21% were 65 years of age or older. The gender makeup of the city was 46.0% male and 54.0% female.